Many analysts forecast that once Apple launched the iPhone XR on October 26th, it would soon be the top seller among the 2018 models. And sure enough, that is exactly what took place in the U.S. during November, says Consumer Intelligence Research Partners (CIRP, via MacRumors). Last month, the lowest priced of the new iPhones made up 32% of stateside sales in the U.S. for that month. The more expensive iPhone XS and iPhone XS Max made up approximately 35% of U.S. sales combined. Last year, the iPhone X accounted for 30% of U.S. sales in its first full month of availability. The iPhone 8 and iPhone 8 Plus combined to make up 39% of Apple's stateside handset sales during the same time period. November was the first full month that the iPhone XR was available, starting at $749 for the 64GB model, $799 for the 128GB variant and $899 for the version with 256GB of internal storage. 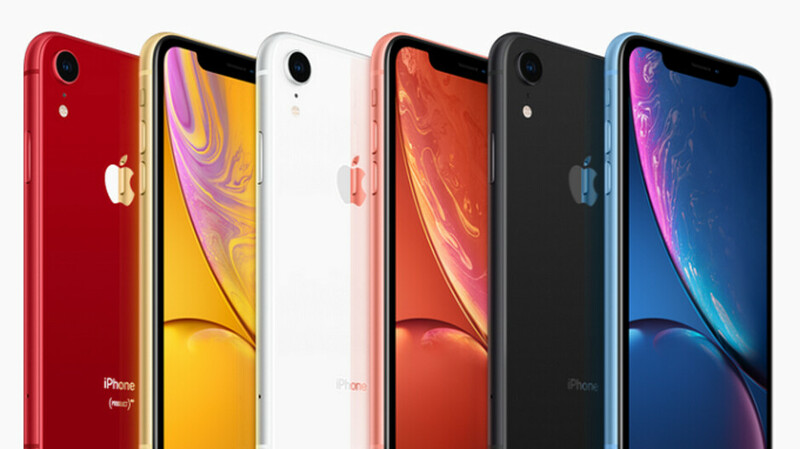 But Apple, seeking to rev up demand for its new handsets, is now offering the iPhone XR for as low as $449 (and the iPhone XS for as low as $699) with the trade-in of an older iPhone model. The data also shows that in the U.S., 82% of new iPhone purchases were made by someone upgrading from an older iPhone model. 16% switched from an Android device. Last year, the figures revealed that 86% of new iPhone units were bought in the states to upgrade an older model, and 11% switched from Android. That means that the 2018 iPhone lineup was a bit more successful in getting U.S. Android users to switch teams. Still, sales of the iPhone XR have been disappointing. In fact, the 2018 iPhones altogether have not enjoyed the consumer demand that Apple was hoping for. Keep in mind that while only 165 Apple customers took part in the survey, CIRP was able to look at past data to determine the significance of the results, seen below. Apple has been pretty much trying to give the Xr away with their incentives, so it doesn't surprise me that it would be the top seller for iPhones last month. But that isn't going to go well with the bean counters in wall street. The iPhone X was the best selling iPhone last year according to that graph (no matter how unreliable it is due to the ridiculous sample size). Lets see what the margins and sales numbers look like in the actual numbers and see what happens. If it's the top selling, then why is there sales on for $650 to buy the iPhone XR outright? So this means that the XR is selling more than the X back in 2017, and the XS duo is selling even more than the X, I think is a huge win for apple considering the price of the XS (Max), don’t you think? Based om what did you came up with this???? Whatever the news is, apple flagships more than any other OEMs flagships. Not only is the XR the best selling, but the iPhone 8 is outselling the iPhone XS as well. Evidence Apple is charging too much? 3 best selling phones are their cheapest options still sold as new. where did you get the idea that 8 is outselling XS? It definately isn't. Their top 3 best selling phones are XR, XS Max and XS Their second best selling model is their highest price model. I think you mean Apple fans, from what I have seen they have difficulty with even basic maths! How do you know? Apple is not publishing sales volume data, let alone product mix. https://mixpanel.com/trends/#report/iphone_Xs/from_date:-117,report_unit:day,to_date:0 This realtime tracker gives quite good picture about product mix. Does it? Not to me until I know more about what is behind the data. For starters it is not about sales, far too many data points for that. Not the first time you have linked to data that is not really relevent to the point in hand. only 165 Apple customers took part in the survey ahahah very presentable sample Yes, there is a more massive vote on your resource, why don't you show the results? It's still too expensive and out of reach for tons of people. Wish it was 800 AUD, definitely not going to pay the 1200 AUD Apple asks for the Xr in Australia. 800 is where I draw the line on a flagship phone. I'm hoping the lower than expected numbers are real, maybe then Apple will revise its pricing and offer something like the Xr for less. I wonder how the fandroids here feel about the conflicting reports on iPhone sales. When the iPhone sells well they pull out the decade old "only brainwashed iSheep buy iPhones" but when the iPhones don't sell well, it must mean the Apple crowd actually have brains of their own and aren't locked in like the fandroids love to believe... Mmm what then? I'm hoping they don't sell well, Apple will have to lower the price or release even better iPhones in the future which is awesome for us and the fandroids get to keep their wet dreams of bad iPhone sales figures that are so critical to their lives. what.. how that data shows that? that data has nothing to do with sales, it's just bunch of phone fans around world voting, it's not even US people only :) so again have no idea why you pasted that. it is true, it was top selling iPhone and best selling smartphone in the world and still is. https://mixpanel.com/trends/#report/iphone_Xs/from_date:-117,report_unit:day,to_date:0 Here is realtime data which shows XR been best selling since launch. It also shows XR had very strong christmas compared to other new iPhones. I’ve seen exactly one, and that was owned by an employee at the Apple store. Around here, it’s mostly older iPhones and Samsung stuff. It’s kind of weird, actually.